When I was working on my PhD at the University of Hawaii (UH), we became the first academic institution in the world to obtain an Avid non-linear digital editing (NLE) suite. An Avid NLE was purchased in early 1990 due to the vision and determination of Stan Harms and Dan Wedemeyer, professors in the Communication Department (now School of Communications) and Patricia Amaral Buskirk, Director, who managed the department’s Media Lab. The AVID 1/ Media Composer system with a Macintosh IIfx arrived in the spring of 1990 and was set up in the Media Lab. Patricia Amaral Buskirk put the system together and made it work. That was no easy task as it required a good understanding of the Macintosh computer and the newest developments in digital technology. Not to mention a lot a concentration and patience. 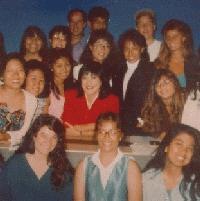 We tried it out that summer with a program I used to run for the Hawaii Department of Education and the Departments of Communication and Journalism at UH called the SPEBE Center for Modern Media. It brought some of the brightest high school students from around the Hawaiian islands to the University of Hawaii for six weeks to give them an experience of college life. (Pictured on left with Jade Moon in red, a TV news broadcaster who taught for us) Patricia Amaral Buskirk and Susan Gautsch trained the students on the Avid and helped them produce short videos on U.S. Presidents. That Fall semester we used it in an International Communication class I was teaching to produce a short documentary on satellites. Nonlinear video editing uses the power of the computer and has added a whole new range of editing power and flexibility to the visual story-making process (much like word-processing changed the writing process) but the system would be almost unrecognizable by modern standards. It displayed very low resolution clips on the computer screen and the editor would create the narrative and in the process compile an edit decision list (EDL). The desktop computer which was connected to traditional video cassette recorders would “auto assemble” the final video and record it back onto video tape. According to Patricia Amaral Buskirk, “What that meant was we had the playback and record decks (with time code) controlled by the AVID and then we would pop in the original Source Tape when asked, and the system would edit (auto assemble) the final version (that was digitally edited on the computer) onto the tape in the Record deck.” Despite the state-of-the-art microprocessors and hard drives that came with the system, they couldn’t handle all the large high-resolution clips that contemporary NLE systems use. Successive upgrades and a fair amount of money over the years allowed for better and better resolution until the external card sets were not needed. Eventually, other professors started to use it and of course NLEs are now standard equipment for video post-production throughout higher education and in the film and television industries. But as far as we know, UH was the first university to obtain and teach non-linear editing. Patricia Amaral, who received a MFA graduate degree in Film and Video production at Savannah College of Art & Design (SCAD), ran AB Productions, Inc., a full service digital audio and video production company in Georgia, but has returned to the University of Hawaii faculty as an Assistant Professor. 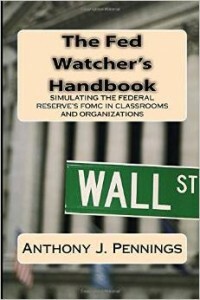 Anthony J. Pennings, PhD has been on the NYU faculty since 2001 teaching digital media, information systems management, and global communications.